The term ‘Hellenistic’ was derived from ‘Hellenes’ which means Greeks. Hellenistic period signified by the legacy left by Alexander III, known as Alexander the Great who extending the reach of his rule not only to the whole Macedonian and Aegean Isles, but to Egypt, India, Persia, and across the Eastern Mediterranean. It was happened in the second half of the fourth century CE. Alexander III was the successor of his father; Phillip II, the ruler of a kingdom situated in northern Greece known as Macedonia. Some Greek thought Macedonians were Barbarians even though their Kings claimed descant of Greek origin; trace back to the Greek’s Heracles. According to J.M. Roberts, some scholars said that Macedonia was not a part of Greek as its power rested on a warrior aristocracy. In other words, their power resting more on personal ascendancy, unlike Greek city states which emphasized on institutions. William L. Langer seems to extend J.M Roberts’s idea, says that Hellenistic was characterized by the atrophy of the city states. That means, Greek which consists of democratic city states started to be dominated by their richer or better educated leader while total of the population lost power. This is true by the case of Phillip II and Alexander III (the Great) who storing the tyrant system of politics after conquering other regions. Nevertheless, as been mentioned above, kings of Macedonia claimed descant of Greek origin; trace back to Heracles (a divine hero in Greek mythology, the son of Zeus and Alcmene), and their claim was recognized, generally. 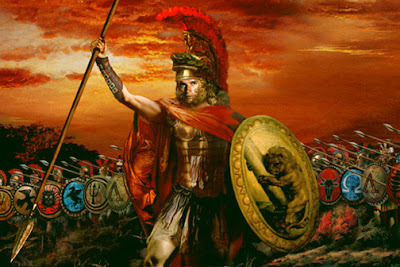 Alexander the Great (r. 356-323 B.C) was the ruler of ancient Macedon whose military genius and towering ambition enabled him to spread his empire throughout southern Asia and middle east in a little over decade. Born in Pella in 356 BC, Alexander was tutored by Aristotle until the age of 16. The disintegration of military and political power in individual Greek’s cities provided opportunity for his father, Philip II of Macedon. In 338 B.C, Battle of Chaironeia took placed. Philip won over an alliance of southern Greek’s states led by Athens and Thebes. Philip was assassinated in 336 B.C, and his son Alaxender the Great succeeding his father in 336 B.C. Eventually in 334 B.C, Alexander took over Persian war himself. By the age of thirty, he had created one of the largest empires of the ancient world, stretching from the Ionian Sea to the Himalayas. He was undefeated in battle, and is considered one of history's most successful commanders. 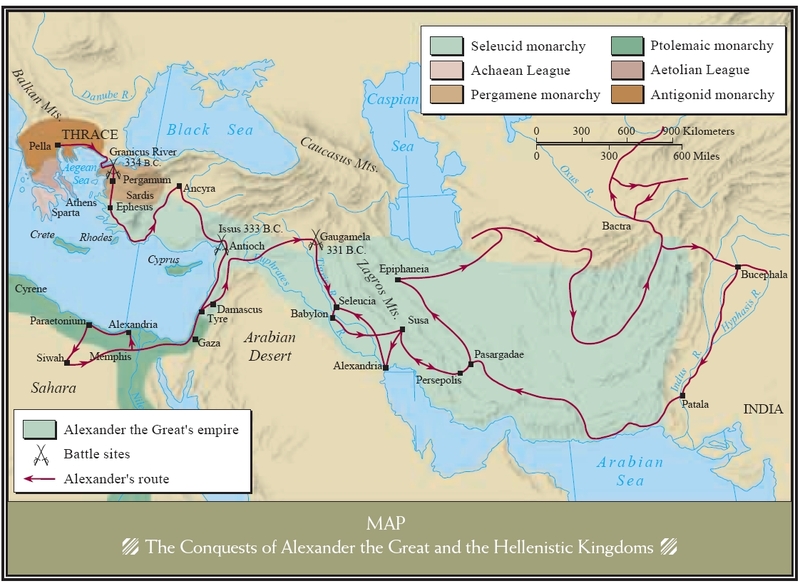 During a decade of campaigning, Alexander conquered the whole Persian Empire, overthrowing the Persian King Darius III and conquered the entirety of the Persian Empire. In the spring of 334 B.C, Alexander’s army of 32,000 infantry, 5000 cavalry, and 160 ships crossed the Hellespont and defeated the Persians at the Battle of Granicus. In 333 B.C, he won another victory against the Persians, at Issus. Alexander marched on and besieged Tyre, before advancing into Egypt where he founded the City of Alexandria. In 331 B.C, he left Egypt and again defeated the Persians at Guagamela, before capturing the cities of Babylon, Susa and Persepolis. In pursuit of Darius 3, Alexander marched through the heart of central Asia. At the foot of the Himalayas, his army refused to cross the daunting mountain chain and Alexander turned south, following the Indus River to the Indian Ocean, before marching west through the desert of Gedrosia. Alexander returned to Babylon, where he died at the age of 32 or some scholars said 33. The Macedonian Empire collapsed into civil war almost immediately after his death. His heirs, a mad brother and an infant son were murdered and his Macedonian generals (the Diadochi), whom he had appointed provincial governors fought to carve out independent kingdoms for themselves in the lands Alexander had conquered. There was more-or-less forty years of constant war between his generals (the Diadochi) for the rule of his empire. By about 281 BC, the situation had stabilised, resulting in four major domains: The Antigonid dynasty in Macedon and central Greece; The Ptolemaic dynasty in Egypt based at Alexandria; The Seleucid dynasty in Syria and Mesopotamia based at Antioch; and The Attalid dynasty in Anatolia based at Pergamum. The Hellenistic Period ended with the defeat of the Macedonian Dynasty of Ptolemaic in Egypt to the Roman in the Battle of Actium. However, the educational, cultural and commercial links that Alexander had forged between the Mediterranean, the Middle East and Southern Asia formed the backbone of the later Roman Empire. The contributions of Greek Civilization in the field of knowledge and philosophy were undeniable. Throughout the Hellenistic Period, the influence of Greek started to merged and accommodate with the culture outside Greek especially Asia. All civilizations that emerged after Greek, even Muslims world, benefited a lot from Greek’s legacy. A growing confidence in rational and conscious enquiry can be considered as the key of its achievement. Ackermann, Marsha E.... et. al. (ed) (2008), Encyclopaedia of World History, New York: Fact On File Inc.
Daud, Wan Mohd Nor Wan (1998), The Educational Philosophy and Practice of Syed Muhammad Naquib al-Attas; An Exposition of The Original Concept of Islamization, KL: ISTAC. Davis, Adam Hart- (ed.) (1997), History, London: Dorling Kindrsley Ltd.
Al-Ghazali, Abu Hamid Muhammad trans. by Ahmad Fahmi Zamzam (2010), Ayyuhal Walad, Kedah: Khazanah Banjariah. Guthrie, W.K.C. (1991), The Sophists, Great Britain: Cambridge University Press. Luce, J. V. (1992), Introduction to Greek Philosophy, London: Thames and Hudson. Magee, Bryan. (2001), The Story of Philosophy, London: Dorling Kindersley Ltd.
O’Brien, Patrick K. (ed.) (2000), Encyclopaedia of World History, New York: George Phillip Ltd.
Sowerby, Robin (1995), The Greeks; An Introduction to Their Culture, New York: Routledge. Teichmann, Jenny Katherine C. Evans (1999), Philosophy: A Beginner's Guide, Oxford: Blackwell Publishing. Bill Kte’pi “Hellenization” Marsha E. Ackermann ... et. al. (ed) (2008), Encyclopaedia of World History, New York: Fact On File Inc., pp 192-193. J.M Roberts (1987), The Hutchinson History of The World, London: Century Hutchinson Ltd, p. 203. Grant Uden (ed.) (1989), “Hellenism”, Longman Illustrated Encyclopaedia of World History, London: Ivy Leaf, pp. 406-407. John Middleton (ed.) (2005), World Monarchies and Dynasties Vol. 1, New York: M.E. Sharpe, pp. 28-29. Patrick K. O’Brien (ed.) (2000), Encyclopaedia of World History, New York: Geoge Phillip Ltd., p. 9. Tony Allan (ed.) (2007), World History; An Illustrated Timeline, London: Brown Reference Group, p. 57. John Middleton (ed.) (2005), pp. 30-31. *Dedicated to Al-Marhum Prof. Dr. Ghassan Taha Yassin. May Allah bless his soul, Amin.